Tick replay is needed in order to get bid/ask data. 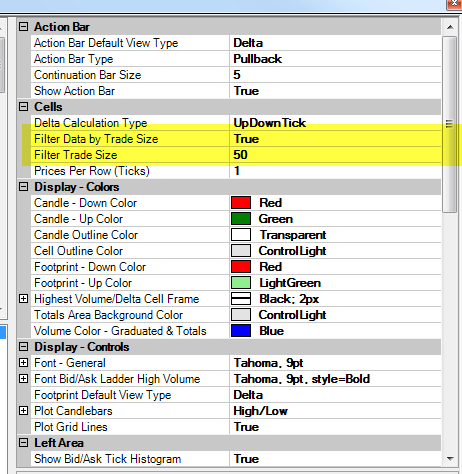 Tick replay MUST be manually enabled on the primary Data Series and the option to allow this mode is hidden by default. 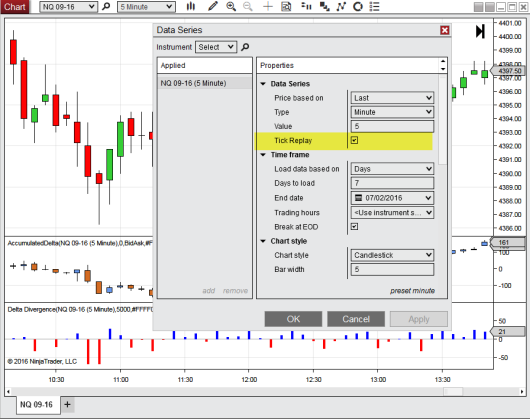 The option to allow for Tick Replay is located in Tools > Options > Market Data > "Show Tick Replay"
Some data is missing or MarketBalance take forever to load, what can I do? Open a normal 1500 Volume chart, make sure it load correctly, then you can add the MarketBalance indicator to the chart, once it load correctly you can change the time frame to what ever time frame you need, no need to do this every time, do this procedure just in case of a problem. Do I need separate data feed? Set "Filter Data by Trade Size" = True and select the trade size in "Filter Trade Size"
What is the difference between MarketDelta and MarketBalance? Is MarketBalance Available for Purchase at one time fees? "Market Balance total cumulative volume" use the volume data as report by NT and you can confirm this with the using the VOL indicator of NT, you will see they match. NT Market analyzer use different total daily volume data which is reported by the exchange/data vendor and it is not the summary of all the reported data but something different. you can confirm this by comparwe to the total volume reported by the VOL indicator, you will see they are different. In NinjaTrader Control Center choose File-> Utilities->Remove NinjaScrip Assmbly, from the list of assmblies select Final.MarketBalance and press the Remove button.